Craig used to be a closet smoker. He only smoked while he was at work or in his car. He never smoked in our home or in front of us. He smoked before we met and quit before we got married. Craig started smoking again after Fletcher was born. It was kind of a release for him or coping mechanism, I guess. I really hated that he smoked and would randomly ask him to quit. I tried not to nag, but it really bothered me that he was smoking. Well, about two and a half years ago he quit! Unbeknownst to me, he was putting the money he spent each week on cigarettes into an envelope. In February, when we celebrated our tenth anniversary, Craig told me about the envelope and that he was saving the money for the two of us to go on a trip! A few weeks later, we went to a travel agent and booked a trip to Playa del Carmen, Mexico! As I write this, that trip has come and gone, but it was AMAZING! And just what Craig and I needed! We stayed at a five star all-inclusive resort called The Royal. It was beautiful! We were greeted by a Romance Concierge, who was able to set up a romantic dinner on the beach and help us with anything we needed. It was fabulous! Before our trip we decided we didn't want to be tourist, we wanted to relax and just be with each other. We then decided we would spend one day on some kind of excursion. We ended up going to Tulum and Xel-Ha, both places Craig went as a boy. So, that was a fun day filled with an adventure to the Mayan ruins in Tulum, then snorkeling and dolphin watching and such at Xel-Ha. It was so fun! We started each morning with a breakfast buffet, then we'd spend the morning either at the pool or on the beach. Then we'd go have some lunch then take a nap or read or just do whatever we wanted! After relaxing each afternoon we would pick one of the nicer restaurants for dinner! We also celebrated Craig's 45th birthday while we were there. How fun is that?? All in all it was a fantastic trip and I'm so grateful to have such a thoughtful, loving husband! I appreciate him more than he'll ever know! Well, July was busy and I'm looking forward to a little bit of a lull before school starts! Last week Fletcher finished summer school, he was weepy each day and didn't get a whole lot of work done. But eventually we managed to get a little work out of him. I'm so proud of him. Fletcher did an amazing job sorting and putting together his alphabet book! Fletcher has been tolerating being off the ventilator for 3 hours at a time, twice a day. About a week and a half ago we tried being off for 4 hours but he kind of hit a wall and we had to back him down to 3 hours. They usually sprint him first thing in the morning and then around 7 in the evenings. Fletcher and I have been enjoying morning walks without the ventilator and using his new manual wheelchair. He's not really a fan of the manual wheelchair but I love that thing because it's so cute and little, just like him! Fletcher's really proud that he's been sprinting. How do I know? Well, when we take our walks everytime we see someone, anyone in the hallway he touches his vent tubing and points at the person we're talking to. He wants me to tell the person that he's sprinting these days. We tell EVERYONE, sometimes we tell the same person several times on one walk! He should be proud of himself, breathing is hard work and something most of us take for granted. Well, we just finished our first week of summer school. When I say we, I mean Fletcher is a student at summer school and Maddie is volunteering with the 1st and 2nd graders. And I have managed to get myself on the payroll at Bethany Elementary, as a teacher's assistant! It's only for four weeks so I think I can handle it. The teacher Maddie is helping absolutely loves her and thinks Maddie is the best helper! Maddie thinks she's 'teaching' the 1st and 2nd graders! She's very excited to go each day. That's such a blessing. Maddie has surprised me quite a lot this summer with her independence. She has always been a mama's girl, so I've been blown away by the fact that she has walked into two different elementary schools, not knowing a soul in either school, once for Summer Spectacular and now summer school. 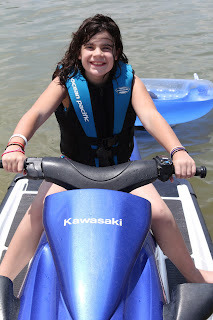 Last weekend we went to my sister's lake house and Maddie rode on the back of a jet ski AND she went tubing on the back of a boat for the first time. I was a nervous wreck the whole time, her not so much! I'm so thankful for this new independence and sad all at the same time. She' growing up on me, y'all! Like I said earlier we went to my sister's lake house at Texhoma last Sunday and had a wonderful time. We just went for the day, but there we lots of Milgrims camping out at her house and we had so much fun! We spent the day at a little beach and the grown ups pulled the kiddos on the tube and gave them rides on the jet ski! We brought Fletcher home for the 4th of July and had a great day with family and friends. The 4th is one of my favorite times not only because we are celebrating the birth of our great nation but also because it's the only holiday Fletcher has been home for every year. I love that we can come together and enjoy each other. Our friends the Jarvis' and the Drechsler family came over throughout the day. The kids played Just Dance and we had sword fights and lots of food! We ended the day at TCC, where we were able to take Fletcher out in the parking lot to watch fireworks. It was a fantastic day! Well, I think Fletcher's going to do just fine in his new unit. He's probably not getting much rest during the day watching all the big boys but he'll sleep better at night, right? Yesterday they upped Fletcher's time off the ventilator to three hours at a time twice a day. He did great and tolerated it really well. Normally when they wean the ventilator they start slow and when they hit two hours they start doubling the time, meaning they go two hours and if they tolerate it the next wean is four hours, then eight hours, then twelve then twenty four hours! I'm so grateful for the slow wean and that they're really thinking about Fletcher and what he can handle. Craig downloaded 1500+ pictures and videos off my iPhone onto my laptop, which will make it so much easier for me to blog! A TCC staff photographer gave me a thumb drive with pictures of Fletcher from the past two years, as well. So, I'll start sharing some of them here on my blog. 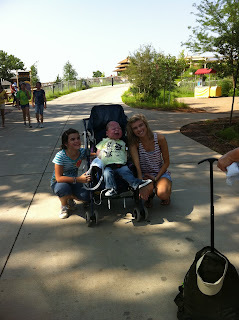 "I can do ALL (breathing on his own) things through Christ who gives me STRENGTH"
Today Fletcher moved into a new unit. There are five teenage boys in there! This is going to be interesting. The unit he just left had children his SIZE not his AGE, so he was the big boy in that unit. It's going to interesting to see how Fletcher responds to these big kids. Several of the boys use power chairs and roll around the place independently, I'm hoping it make Fletcher interested in his new manual wheel chair. Peer pressure can be a good thing sometimes. Fletcher has progressed a lot since he started kindergarten and I'm sure it's because of the kids and their 'typical' behavior. One thing I think most people aren't aware of is that Fletcher is only delayed because of his circumstances not because there's 'something' wrong with him. He's a pretty smart kid and he knows how to get what he wants. For someone with a limited vocal vocabulary he's an extremely good communicator. I know his face is dirty, but this is quickly becoming my new favorite picture! I can hardly believe I haven't blogged since Thanksgiving! Boy, do I have a lot of ground to cover to catch you all up! I really don't even know where to start! Well, we've been really busy. Kayleigh is officially a SENIOR!!! Next week she and I will make a trip to OSU OKC to get an idea of what we need to be doing to get her ready for college. Kayleigh's still not sure what she wants to do career wise so it's time for us to get busy! Kayleigh is also looking forward to spending a few weeks in Mississippi with her maternal grandparents. Maddie finished up third grade and had a great year academically. She is enjoying summer! This year Maddie is attending a little day camp called Summer Spectacular. It is three weeks long and each week she took a different class of her choice. The first week was Math Mania, which she loved! The second week she chose a reading class and thoroughly enjoyed it. This is the last week and she's taking a French class and I'm pretty sure it's her favorite of all three classes! Next month she is going to summer school with Fletcher to volunteer with the special needs kids. Then hopefully a break before school starts! 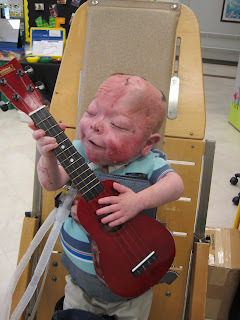 Fletcher turned six last December and right after his birthday they started slowly weaning his ventilator settings. By the end of February, Fletcher was on CPAP settings, meaning he was initiating all the breaths by himself! On May 24th I got a phone call from his nurse practitioner, Julie telling me they had just 'sprinted' Fletcher off the ventilator for 15 minutes! 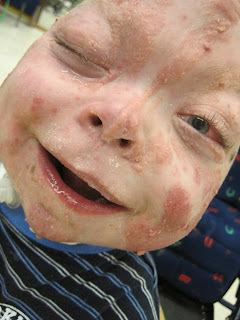 He was completely OFF the ventilator, breathing on his own for 15 minutes!!! So the process has begun to get him off the ventilator completely! Each week since, Julie has added 30 minutes at a time of him being off the ventilator. He's off the ventilator twice a day, once in the morning and once in the evening. Tonight he will go for 2 hours!!! He's tolerating it well. He's still a bit anxious about the whole thing but there is always someone near when he's off so they can help him if he gets in any trouble. If Fletcher can come off that ventilator completely he can come home and live with us! I don't know how long it will take but, there is an exit plan in place, kind of! We, of course, have always said we would bring him home when he got off the ventilator but I'm not sure 'other people' really thought he'd ever leave The Children's Center. It's very exciting and scary all at the same time. Exciting, because we'll all finally be under one roof. 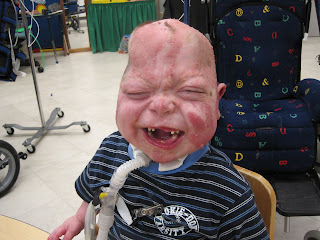 Scary, because he's still a kid with some pretty intense special needs and we'll be taking care of him by ourselves. Financially, it will probably be a stretch for us and I can't in my feeble brain see how the Lord will work that all out, but I'll let the Lord think on that one and work it out for us! I'm standing on Philippians 1:6 "For I am confident of this very thing, that He who began a good work in you will perfect it until the day of Christ Jesus." The Lord is faithful and finishes what He starts. Our children belong to Him and He will take care of them. A good friend, reminded me that the Lord is not only preparing Fletcher, He's preparing ME for this new adventure of having Fletcher at home full time. I'd appreciate your continued prayers as we travel this Long Journey Home!